I love working with my honeymooners, especially on unique excursions that balance active adventure with romantic relaxation. Check out this client’s honeymoon! The historical commercial capital of Japan, Osaka is Japan’s third largest metropolis and it has been the economic powerhouse of the Kansai region for centuries. Osaka first gained prominence when a powerful warlord built the country’s most magnificent castle in the 16th century. To develop resources for his castle town, the ruler persuaded merchants from other parts of the nation to resettle in Osaka and it became an important distribution center. As the merchant class prospered, the town grew and traditional arts such as kabuki and bunraku flourished. With the legacy of the city’s commercial beginnings still intact, Osaka is renowned as a hub for international business. It is also famous for its local cuisine, large aquarium, underground shopping arcade, and its popular Universal Studios amusement park. The morning is at your leisure to enjoy. 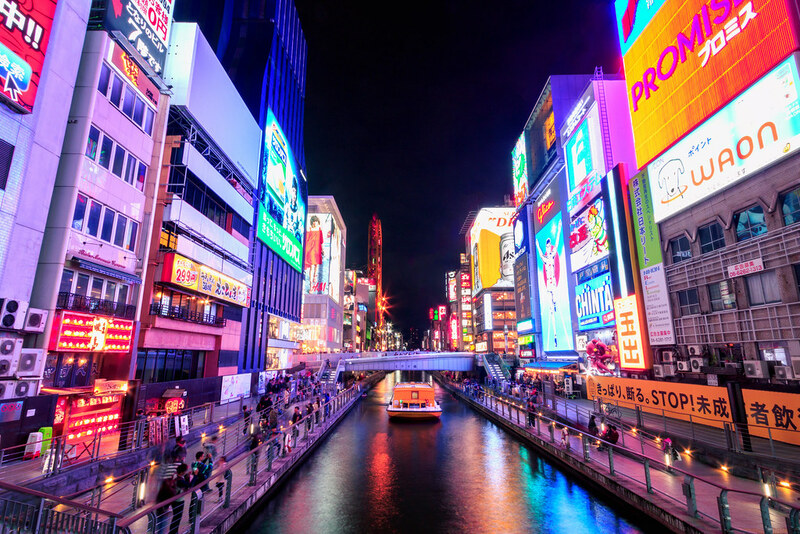 In the evening, your guide will meet you at hotel and introduce you to the splendors of Osaka’s casual cuisine, venturing into the epicenter of street food culture in Osaka: Dotonbori. Dotonbori is a famous pedestrian-only restaurant street in Osaka’s boisterous Namba district. Famous for its vast array of culinary options, Dotonbori is known as a food paradise throughout Japan. This is where Kansai people come to celebrate! Colorful eateries and bars line the neon-filled streets: hole-in-the-wall takoyaki stands and street-side ramen bars rub shoulders with upscale eateries serving the finest wagyu beef – and everywhere, people – young and old – out to enjoy the culinary pleasures of the nation’s most famous restaurant district. You’ll have the chance to sample a variety of local foods, including the famous and ubiquitous takoyaki (commonly known as “octopus balls”) and kushikatsu (skewered meats and vegetables). The cost of these – and one drink a piece – is included. Your guide can also take you to a huge variety of other establishments, from ramen noodles to izakaya bars. The cost for your orders here will be on you. Afterwards your guide will take you back to your hotel, or direct you to elsewhere nearby if you prefer to keep eating and drinking! This is a must-see destination in Japan. Kyoto is the nation’s former capital and was the residence of the emperor from 794 until 1868. With 2,000 religious buildings, including 1,600 Buddhist temples and 400 Shinto shrines, as well as palaces, gardens and associated architecture, it is one of the best-preserved cities in Japan and has 17 UNESCO World Heritage sites. Kyoto represents the “Japan of old” and beyond the high-rise skyscrapers built as a monument to progress, the real monument to Japan’s historical and cultural past can be found in the city’s narrow alleyways where tea houses abound and kimono-clad geisha hurry from elegant function to function. 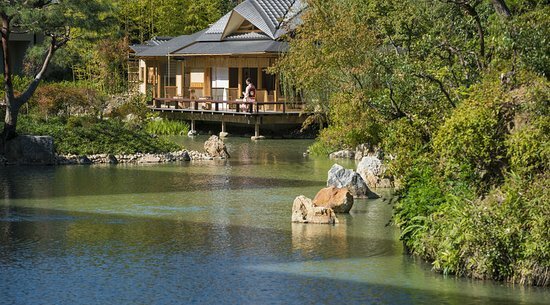 In the morning, your guide will meet you at the hotel and together, head to the Arashiyama district, a pleasant district in the western outskirts of Kyoto. The area has been a popular destination since the Heian Period (794-1185), when nobles would enjoy its natural setting. 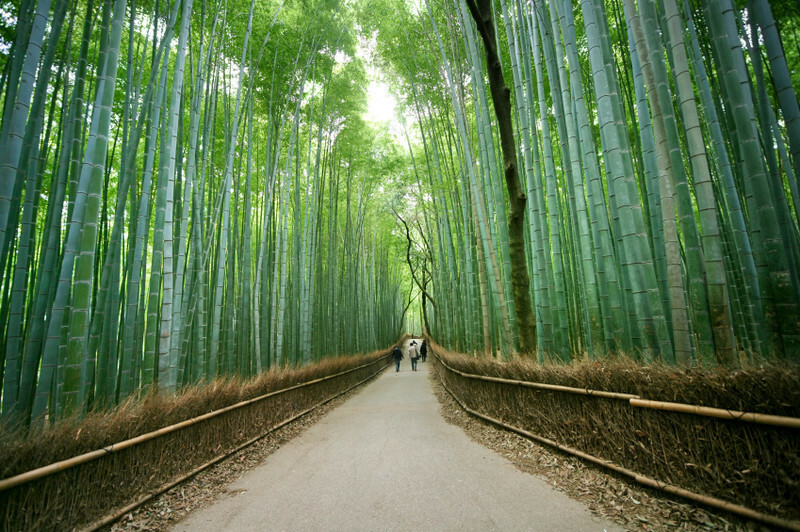 Take a walk through Arashiyama’s famous bamboo groves, which are particularly attractive when there is a light wind and the tall bamboo stalks sway gently back and forth. The bamboo has been used to manufacture various products, such as baskets, cups, boxes and mats at local workshops for centuries. Nonomiya shrine is a Shinto shrine where in ancient times, unmarried imperial princesses stayed for a year or more to purify themselves. Okochi Mountain Villa is the former villa of the popular samurai film star Okochi Denjiro (1896-1962), and consists of several beautiful gardens and buildings, including living quarters, tea houses and a zen meditation hall. Here you will enjoy some matcha green tea with a snack. After short break, visit Tenryuji which is ranked among Kyoto’s five great Zen temples and the largest and most impressive temple in Arashiyama. Founded in 1339 at the beginning of the Muromachi Period (1338-1573), the temple is one of Kyoto’s UNESCO World Heritage Sites. In addition to its temple buildings, there are attractive gardens with walking paths. After a traditional Buddhist vegan lunch, you will head to Arashiyama Monkey Park. After hiking uphill for about fifteen minutes, you will find an open area with over a hundred monkeys roaming freely. There are also nice views down onto the city. End your day with a ride on the Sagano Scenic Railway, also known as the Romantic Train. It is a sightseeing train line that runs along the Hozugawa River between Arashiyama and Kameoka. Its charming, old fashioned trains wind their way through the mountains at a relatively slow pace, taking about 25 minutes to make the seven-kilometer journey and giving passengers a pleasant view of the scenery as they travel from rural Kameoka through the forested ravine and into Arashiyama. Breakfast at your hotel. Today is at your leisure to enjoy. 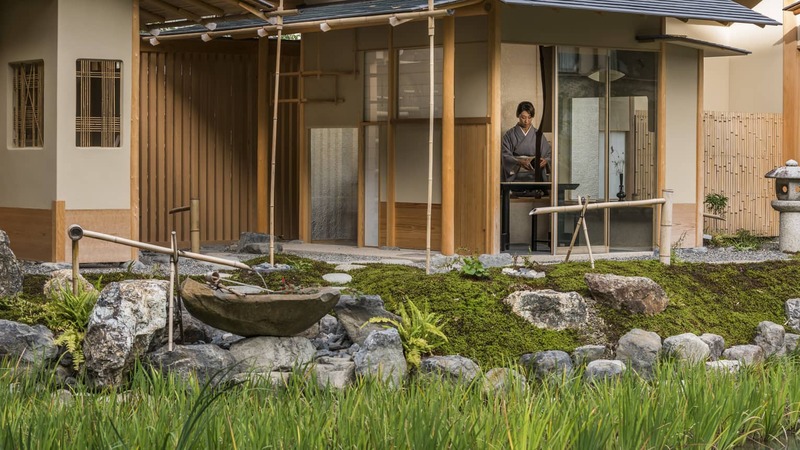 Suggested activity is the Four Seasons Kyoto Spa. The morning is at your leisure to enjoy. In the afternoon, make your way to the meeting point in central Kyoto. 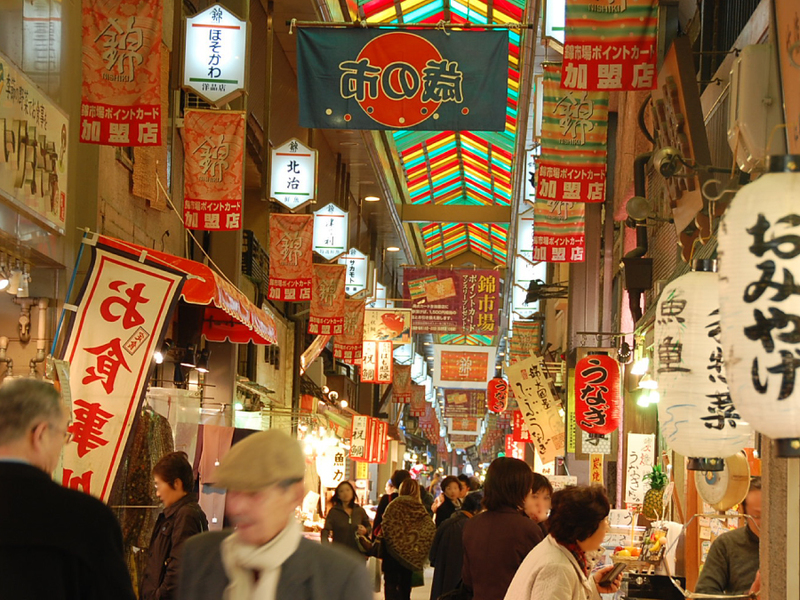 Together with a local guide you will walk the mile-long Nishiki covered food markets, where there are many interesting food stores to explore as you help your guide buy the ingredients for your Japanese cooking class. This is a great opportunity to learn about local Japanese produce. After visiting the markets, you’ll travel through the back streets and lanes of Kyoto, and visit a traditional townhouse for a sake tasting. Finish the walk at a traditional wooden townhouse for your Japanese cooking class. Learn how to make rolled sushi, miso soup and cooked salad with seasonal fruit for dessert, and enjoy the results for dinner. Afterward, you are free to continue exploring on your own. Okinawa is an island chain located half way between Japan and Taiwan that stretches for over 1000 km. 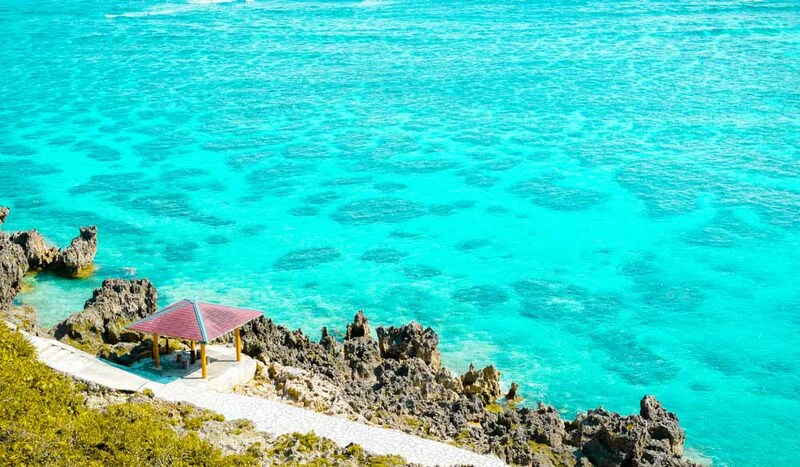 During its long history, Okinawa has its sovereignty as an independent kingdom and been under Chinese and U.S. rule, giving it a colorful culture that you won’t find anywhere else in Japan. Home to more than 300,000 people, Naha is the capital and largest city of Okinawa Prefecture. With its port and airport, it also functions as the regional transportation hub, offering direct flight and ferry connections into other parts of Okinawa, Japan and Asia. The former capital of the Ryukyu Kingdom around Shuri Castle was located within the borders of today’s Naha City. Breakfast at your hotel. Today is at your leisure to enjoy at the beach. One of the world’s most cutting-edge capitals, Tokyo is a city of contrasts. Famous for its sprawling neon-lit landscape it is also home to expansive parkland, peaceful shrines and temples, and lovingly tended gardens. On the surface, Tokyo is a mix of digital trends and conspicuous consumption, but dig deeper and you will find a city rooted deeply in the traditional culture. Shinto shrines and Buddhist temples stand close to skyscrapers as a reminder of a more contemplative time. At the heart of the hyperactive center lies the serene Imperial Palace, the home of the ruling emperor that provides a tangible link to the city’s historical past. 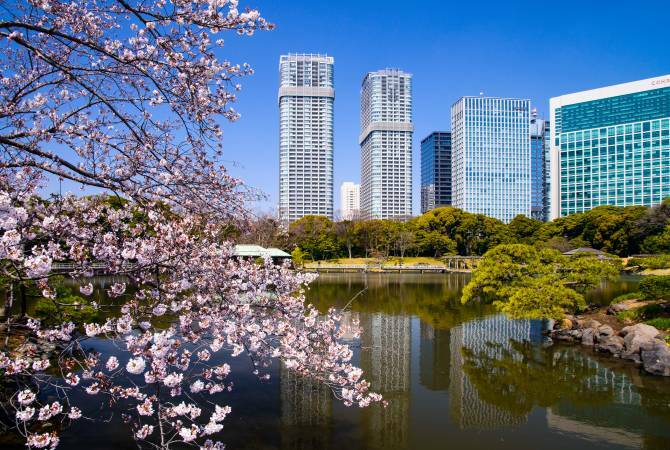 Behind the shopping, entertainment, and commercial emporia you will find quaint wooden houses, private gardens with meticulously clipped bonsai trees and the calm of the Hamarikyu Gardens. The morning is at your leisure to enjoy. In the afternoon, make your way to the venue. Learn more about the legendary samurai warriors in this exciting program. You will wear a samurai costume, learn about the lifestyle and etiquette of samurai classes and finally take the sword and learn the basics of kenbu, a highly stylized sword dance that samurai used to perform as training and to find concentration. This is a unique experience to learn in-depth about this cultural heritage of Japan. The instructors are skilled Kenbu master and are also fluent in English, and they will be happy to answer your questions. At the end of the experience, you are free to continue exploring on your own. In the morning, meet your guide at the hotel and travel to explore part of the Fuji National Park. Today you will visit the beautiful lakeside town of Kawaguchiko, known for its panoramic views of Mt. Fuji and the mountain’s symmetrical reflection in the lake. First stop will be a visit to the lakeside for a journey up the Kachi Kachi ropeway on Mt. Tenjo, allowing you wonderful views across Lake Kawaguchi and of Mt. Fuji, if the weather is fair. After descending, you’ll head to Bat Cave, where large colony of bats used to reside in the winter. Explore this extensive cave with multiple chambers before starting the hike through a section of Aokigahara. Aokigahara literally means “sea of trees”, so named after its vast area of dense, tall trees that at some areas block out the sun above. During the hike, you can visit a couple of other caves as well. The final stop on today’s tour is a visit to Mt. Fuji’s 5th station, where the road runs out on the mountain itself. The views looking down below are quite astounding and you will begin to understand why Japan’s tallest mountain is so very revered. Throughout the day you will have the chance to get a glimpse of Mt Fuji, however, please keep in mind that she is a notoriously shy mountain and it needs to be a clear day. Afterward, you will be taken to your accommodation at a beautiful traditional ryokan near Kawaguki Lake, where a traditional Japanese dinner awaits! Breakfast at your hotel. Afternoon is at your leisure to enjoy. This privately guided tour will take you to the family-run Kakinuma Tea Shop located close to Sensoji Temple in Asakusa, where you will have the opportunity of participating in a Japanese tea ceremony as well as tasting various kinds of Matcha green tea. First, you will take part in a traditional Japanese tea ceremony that is conducted exclusively for your group. 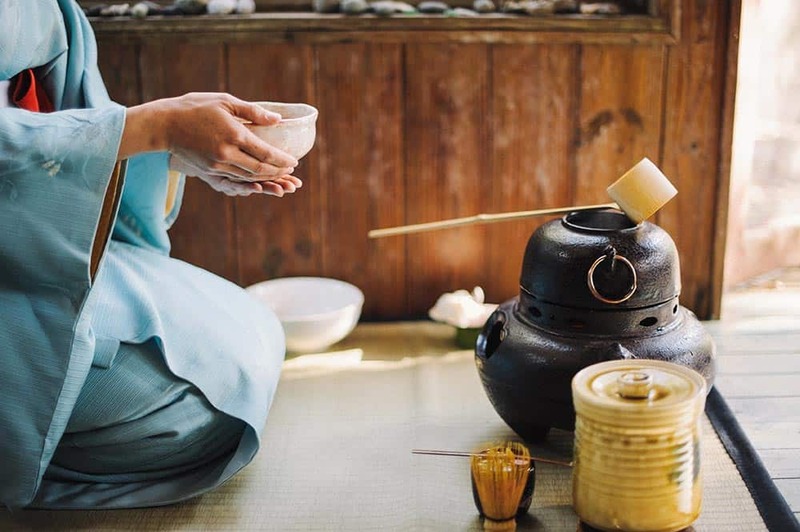 Here, a member of the Kakinuma family will instruct you on the traditional art of Japanese tea ceremony and will prepare a thick tea made of powdered green tea leaves for you. A Japanese confection will also be served alongside the tea. With the skilled guidance of the tea master, you will be able to observe the graceful movements of tea preparation up close and will learn the ceremonial way of drinking tea. Afterwards, you will have the chance to taste various grades of tea, ranging from ordinary green tea purchasable at the supermarket right up to the finest green tea used by reputable tea masters. During your tasting, the shop owners will be happy to share with you the stories of some of their favourite items in the tea shop– you will soon find out that every single detail in the tea room is considered by the ceremony master. We highly recommend that you purchase a few souvenirs here- the tea tools and cups make wonderful talking pieces in your home.